Welcome to the Super 8 West in El Paso, TX. We are conveniently located off of I-10, exit 11. Our newly renovated inn has many restaurants, attractions and shopping nearby. Our friendly staff is waiting to accommodate your lodging needs and available to help you 24 hours a day. We provide complimentary Free Continental Breakfast, Free High Speed Internet and an outdoor Seasonal Swimming Pool. All of our rooms have a work desk, in room coffee-makers, hairdryers and cable TV including HBO. Whether you are traveling for business or pleasure you are sure to appreciate the convenience of parking right by your room. If you arrive late at night or just get hungry for a midnight snack, we have a 24 hour restaurant right next door. We also welcome your oets in designated rooms for a nominal fee. 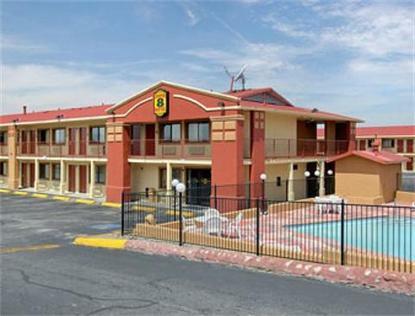 We look forward to seeing you at the Super 8 of El Paso, your home away from home! Our lobby is located next to the pool area.